results = getSpectralMaskStatus(scope) returns the current status of the spectral mask on the spectrum analyzer, scope, in a structure, results. This example shows how to add a spectral mask to an existing dsp.SpectrumAnalyzer System object scope and get the status with getSpectralMaskStatus. 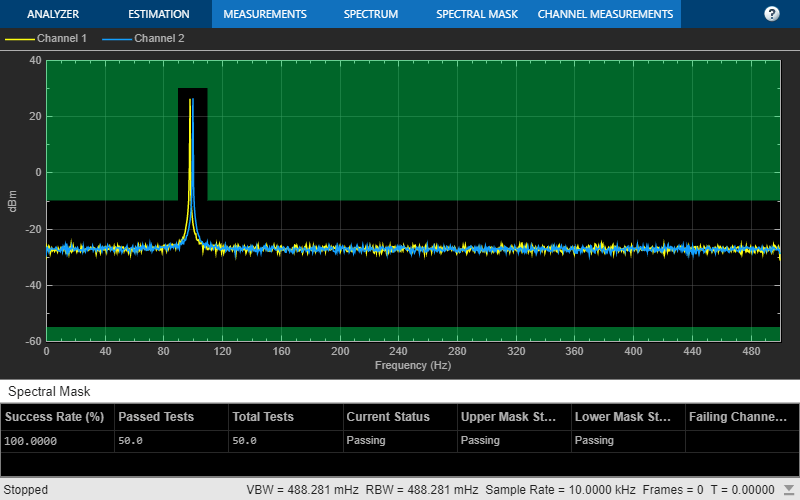 In the Spectrum Analyzer, you can see the same information in the Spectral Mask panel. Spectrum Analyzer with spectral masks whose status you want to check. Specified by the name of the dsp.SpectrumAnalyzer object.